Moths and bugs can do extensive damage to your wool rug if gone undetected. Adult moths lay their eggs in wool because it is a sustainable food source for the larva. There are two types of moths that are a danger to your wool rugs and clothing; the casing moth and the webbing moth. The webbing moth is more common in Pennsylvania. The webbing moth can remain in the larva stage for up to 2 years all the while consumer your oriental rug. Watch these videos to find out how to identify if moths or bugs have been enjoying your tasty area rugs and to learn how to prevent moths from taking residence in your area rugs. Most moth damage occurs to improperly stored rugs and under large furniture. Soiled rugs are more attractive to moths because they are seeking nutrients like vitamin B left behind by pets, people, and spills. For this reason, wool area rugs should always be thoroughly cleaned before storing. If your rug has been susceptible to moths or you are storing it for longer than 30 days, we recommend the application of a moth repellent. At River Valley Rug Cleaning in York PA, we apply a moth treatment to both the front and back of the rug after a thorough cleaning. This treatment will not change the color, texture, or feel of the rug, but will deter the moth larva from making a meal out of you fine Persian rug. Are you looking for a rug cleaning service that values its customers and delivers on its claims? 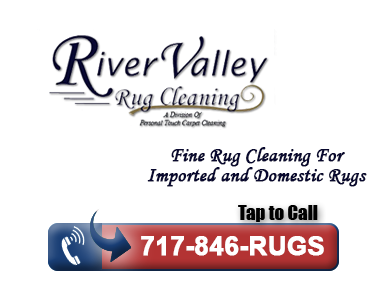 At River Valley Rug Cleaning, we always strive for excellence in customer service because we recognize the importance of our clients. We also understand that top-of-the-line customer service involves more than simply showing up for appointments on time and treating our customers — it also means using the best available cleaning techniques and equipment and providing our employees with the necessary training to do the best possible job. Instead of simply covering your carpet with strong, chemical-laden perfumes and calling it clean, we use an innovative cleaning process that gets your rugs clean down to the last fiber. Whether you’ve got wall-to-wall carpeting or area and throw rugs, you undoubtedly know that clean floor surfaces are a vital component in maintaining a comfortable, pleasant, and healthy household. You are probably also aware that moths can do quite a bit of damage to household items that contain wool fibers, so if you have invested in quality carpets and rugs, it’s important to protect them from harm. Our professional rug moth treatment services is part of a maintenance program that will keep your carpets looking new and fresh for years to come. We recognize that the best and most innovative products won’t be effective if used improperly, and that’s why we make certain that our technicians are thoroughly trained in using our products and equipment. You can count on our employees knowing what they’re doing when they come to your home. Naturally, you want your carpeting and area rugs to be safe as well as clean places, particularly if you have children or pets in the home that routinely play on carpeted areas. That’s why we use state-of-the-art cleaning equipment and environmentally safe cleaning products. We find that this combination is highly superior to using harsh chemical cleansers that can leave a significant residue on carpet fibers. You can rest assured that your little ones and furry friends can safely spend time on your carpets and rugs after we’ve cleaned them and treated them against moths. For excellent customer service and a superior cleaning job, call us today at River Valley Rug Cleaning to schedule an appointment. We’ll leave your carpets and area rugs clean down to the last fiber and protected from moth damage so that they’ll remain beautiful for years.